Proposed two stage to orbit vehicle. Air-breathing hypersonic first stage and delta wing second stage. 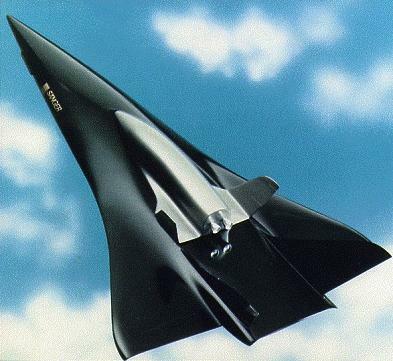 The German Hypersonics Programme and its Saenger II reference vehicle received most of the domestic funding for spaceplane development in the late 1980s and early 1990s. Status: Study 1985. Thrust: 4,500.00 kN (1,011,600 lbf). Gross mass: 366,000 kg (806,000 lb). Height: 101.00 m (331.00 ft). Diameter: 14.00 m (45.00 ft). On 18 October 1985 Messerschmidt-Boelkow-Bloehm (MBB) began renewed studies of the Saenger spaceplane, this time a two-stage-to-orbit horizontal takeoff concept. In early 1987 the German government funded a comprehensive study to refine the Saenger II design. Further funding under Germany's Hypersonic Technology Program followed in1988-1993. This resulted in Europe's first turboramjet engine beginning ground run at MBB in 1991. In 1994 it was concluded that development would have been very costly, while the design would reduce costs only 10 to 30% below that of the Ariane 5 expendable vehicle. Accordingly the project was cancelled. Saenger II would have a gross mass of 750,000 kg, and could place a payload of either two crew and 3,000 kg using the Horus winged upper stage, or a 15,000 kg payload with the unmanned Cargus upper stage. Stage 1 would cruise on turboramjets at Mach 4.4 to the launch area, then dash to Mach 6.0 and release the upper stage. The stage would also form the basis for an 11,000-km-range European hypersonic transport, accommodating up to 36 passengers. Two subscale prototype vehicles would be available by the late 1990's, and the full sized X-2000 prototype by 2005. Flyaway Unit Cost 1985$: 28.000 million. Stage 1. 1 x Sanger II-1. Gross Mass: 254,000 kg (559,000 lb). Empty Mass: 156,000 kg (343,000 lb). Thrust (vac): 1,499.995 kN (337,212 lbf). Isp: 1,200 sec. Burn time: 6,565 sec. Isp(sl): 3,600 sec. Diameter: 14.00 m (45.00 ft). Span: 41.40 m (135.80 ft). Length: 84.50 m (277.20 ft). Propellants: Air/LH2. No Engines: 6. Engine: Co-axial turboramjet. Other designations: EHTV. Status: Study 1985. Comments: Releases Horus @M 6.6 @ 37 km altitude @ 3100 km range. Stage 2. 1 x Sanger II-2. Gross Mass: 112,000 kg (246,000 lb). Empty Mass: 32,600 kg (71,800 lb). Thrust (vac): 1,280.003 kN (287,756 lbf). Isp: 490 sec. Burn time: 298 sec. Isp(sl): 409 sec. Diameter: 5.50 m (18.00 ft). Span: 15.60 m (51.10 ft). Length: 27.60 m (90.50 ft). Propellants: Lox/LH2. No Engines: 1. Engine: ATCRE. Other designations: Horus. Status: Study 1985. Comments: 6000 kg to LEO. Family: orbital launch vehicle, Winged. Country: Germany. Engines: ATCRE, Co-axial turboramjet. Spacecraft: Horus. Stages: Sanger II-2, Sanger II-1. Agency: MBB. Bibliography: 44, 8577.